The reclamation practice, known as surface drainage, can be defined as the diversion or orderly removal of excess water from the land through ditches or by shaping of the ground surface. Sometimes, a subsurface system of drain pipes is needed in conjunction with the surface drainage measures (see Chapter 5, Section 5.6). Design discharges generally are based on rainfall intensity because this is almost always the most critical source of excess water. Rainfall-runoff relationships are a classical problem in hydrology, for which several approaches have been proposed. These range from simple formulas that give only the peak discharge value, such as the rational formula method, to complex physically based models that allow the simulation of distributed hydrological processes . The rate of removal is called the "drainage coefficient," which usually is expressed in terms of flow rate per unit area and varies with the size of the area. Table 4.2 gives an idea of the order of magnitude of drainage coefficients for flat, medium-size (10,00025,000 ha) agricultural basins . The values given for the Netherlands apply to basins with predominantly subsurface drainage, whereas those for Yugoslavia apply to a combination of subsurface and shallow drainage. Surface drainage, when properly planned and designed, eliminates ponding, prevents prolonged saturation, and accelerates flow to an outlet without siltation or soil erosion. Surface drainage systems can be described and classified in several ways. However, there are basically three types of systems that are in common use today : parallel, random, and cross slope. Under some circumstances encountered in the field, combinations of two or more of these systems may be required. Figure 4.3. Layout of parallel system. Source: . • be designed for construction and maintenance with appropriate equipment locally available. Parallel System. 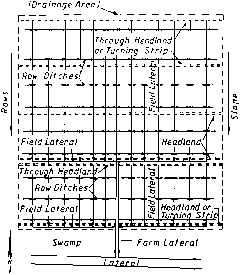 This system is predominantly applicable to fairly regular, even-surfaced, flatland, which adapts well to a parallel alignment of field ditches, which least hinders farm operations. The field ditches are dug in a parallel, but not necessarily equidistant, pattern, as shown in Fig. 4.3. The orientation of field ditches normally depends on the direction of surface slope, location of diversions, cross-slope ditches, and access of the drained lands to farming equipment. The ditches are well incised and definitely aimed at achieving considerable profile drainage together with collecting excess surface water. Usually, the field ditches discharge into lateral ditches, which should be deeper than the field ditches to allow free outflow. The land surface should be shaped and smoothed to favor overland flow. Spacing of parallel field ditches depends mainly on soil and slope characteristics and on the water tolerance of the crops grown. Design specifications for this system are given in Table 4.3. Figure 4.4. Layout of random system. Source: . For water-table control during dry seasons, namely in cases of peat and acid sulfated soil, adjustable weirs or gates are placed at various points in the ditches to maintain the water surface at the required level. During wet seasons these controls may be removed, to let the system provide surface drainage. Random System. 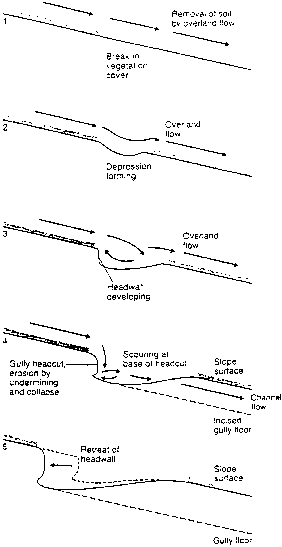 This system, also called a depression ditch system, is applicable to fields in which a limited number of pronounced depressions exist, lending themselves to drainage by means of ditches. The depressions may be drained individually or linked. The layout of the field ditches has to be such that as many depressions as possible are intersected along a path through the lowest part of the field toward an available outlet (Fig. 4.4). The path should be chosen so as to provide the least interference with farming operations and a minimum of deep earth cuts. Therefore, only the main depressions should be provided with ditches; the small depressions should be filled in with, for example, the spoil from the excavated ditches. Where the overland flow rate toward the outlets is too slow, land shaping will be necessary to ensure complete surface water removal. and capacity of the channel. The grade in the ditch should be such that the velocity does not cause erosion or sedimentation. Maximum allowable velocities for various soil conditions are given in Table 4.4. Figure 4.5. Layout of cross-slope system. Source: . • avoiding the concentration of water in shallow pockets within the field. Such ditches usually provide both surface drainage and erosion control. When designed specifically for the control of erosion, they are called terraces (see Section 4.4). Diversion ditches sometimes are used to divert runoff from low-lying areas, thus reducing the drainage problem. Design and Construction Procedures. A general description of design and construction criteria is given here. For more detailed information the reader is referred elsewhere [9-14]. • examination of aerial photographs and remote-sensing information. The next stage consists in the definition of the hydraulic design criteria, which may include a range of options, accompanied by preliminary estimates of costs and benefits. A community involvement strategy also should be developed, paying attention to the possible involvement in drainage responsibilities of both public and private groups. Particular attention has to be paid to the perceived social and environmental impacts. • effects on wildlife and biodiversity. The design of drains and ditches will take into account the area and slope of the catchment, soil permeability, storm characteristics, groundwater interactions, crop requirements, landholdings to be served, construction and maintenance costs and benefits, and maintenance and management requirements. Construction. The selection of equipment and procedures for drain construction varies with the drainage depth and the land and soil characteristics. Blade graders, scrapers, and heavier terracing machines are suitable for depth of cut up to 0.75 m. For cuts deeper than 0.75 m, bulldozers equipped with push or pull back bladers and carryall scrapers can be employed to fill the pothole area or other depression near the point of excavation. Soils that require surface drainage may have depressions, which vary in size and shape. 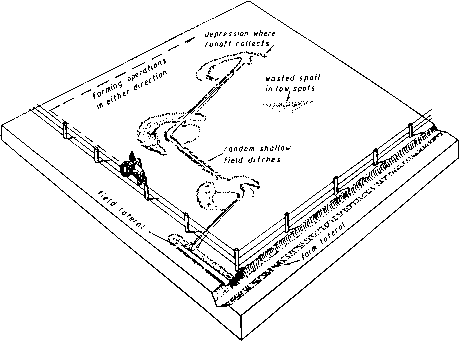 To prevent ponding and to keep the water moving at a uniform rate over the ground, it is necessary prior to the digging of the ditches to fill the depressions and to smooth out the high points in the field. This procedure is called land forming and consists in mechanically smoothing, grading, and bedding the soil surface. This allows better drainage and more efficient operation of farm equipment, cuts down the cost of ditch maintenance, and reduces ice crusting. Shaping land to a smooth surface improves surface drainage. In general terms, land smoothing does not change the main contour of the land but it does eliminate minor differences in field elevation. Soil to be smoothed must have such a profile that small cuts can be made without hindering the soil itself and plant growth. Land grading consists of shaping the land by cutting, filling, and smoothing until continuous surface grades are reached. The purpose is to prevent ponding and prolonged saturation of the soil. Land grading for drainage normally does not require shaping of the land into a plane surface with uniform slopes, but special care must be taken in filling depressions with soil from neighboring ridges and mounds. In areas with little or no slope, grades can be established to direct surface runoff into the ditches. Bedding is the classical land-forming method for flat, heavy land in humid climates. It resembles a system of parallel field ditches with intervening lands shaped to a convex surface. 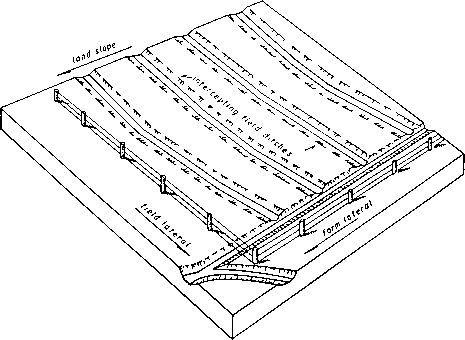 The excess surface water is drained by lateral overland flow toward the field drains (Fig. 4.6). For the typical conditions under which bedding is used, flat beds generally should be no wider than 10 m to obtain good drainage. The beds are made by plowing, blading, or otherwise elevating the surface of flatland into a series of broad, low ridges separated by shallow, parallel furrows. Figure 4.6. Drainage in a bedding system. Source: . either or both directions. These factors make land-grading design a difficult problem to solve. Systematic procedures for land grading were introduced first by Givan  for rectangular fields and by Chugg  for irregularly shaped fields. Both authors applied least-squares methods to define a plane surface that fits the natural ground surface with minimum earthwork. Hamad and Ali  proposed a method using the box-complex approach. Although this method is better than those based on the least-squares techniques, it lacks robustness and requires an initial feasible set of decision variables. Recently, Reddy  devised a new method for optimal land-grading design, based on a nonlinear genetic algorithm, suitable for both plane and curved surfaces while minimizing the total volume of earthwork. The application of this procedure shows that the optimal search is carried out simultaneously in several promising zones of the decision plane and a variety of design constraints can be considered, including curved surfaces. Pareto-optimal solutions, in addition to the best solution, are produced. Pareto-optimal solutions give an opportunity to the designer to use his/her judgment in selecting the most suitable surface based on practical considerations.